Letter Q week was Quite a Quintessential week! Much to the relief of the teachers, letter Q yielded a lot of great and rather impressive words! With all of the Princess and Prince talk during letter P week, Queen shares were to be expected. What was not necessarily expected was the Central/South American bird, Quetzal! Naturally, the thought of a bird with a name so similar to a popular snack food (pretzel) was HILARIOUS for the students. On Monday and Tuesday morning, the students completed their Letter Q identification activity sheets. 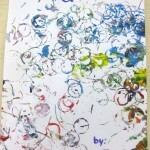 When asked to write the letter Q, some students stated that they did not know how. When they realized that a Q was just like an O with a little tail, they were much more enthused. As far as identifying the Q pictures, this picture of a quilt was clearly the most challenging. 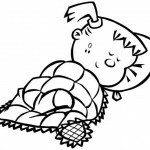 The most popular answer given was sleeping, followed shortly by baby, and then blanket or blankey. When reminded about the letter Q, the students Quickly figured it out. In the afternoon on Monday and Tuesday, the teachers lead a discussion about the different types of coins we use in the United States and why we use them. Quarter, dime, and nickel proved to be a bit tricky but penny was the easiest to recognize. The students practiced identifying these coins by taking turns coming up and choosing coins from a bag. On Wednesday morning, the students put their new quarter knowledge to use by creating a beautiful piece of Quaking Quarter Art! 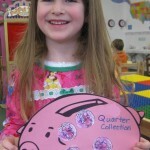 Be sure to view the video below to see one student quaking some quarters! In attempt to Quiet the classroom a bit, some students said they would prefer to stamp their quarters, rather than quake them! 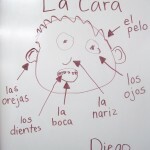 During the afternoon Spanish lesson, the students worked collaboratively to create una cara (a face) on the board. Following Miss Saily’s directions, the students came up and added each face part that was stated. Also introduced was some new vocab – el pelo (hair) and las orejas (ears). Here is la cara (the face) that the students created. They decided to name him Diego after their favorite Spanish speaking friend. To begin Thursday, the teachers showed the students some quarters and asked, “Who is that man?” The teachers explained that he, George Washington, was the first president of the United States and a very important man to our country. For this reason, it was decided that his face would go on the money that everyone in the country would use to buy things like food, clothes, and more. The students listened but seemed a bit unmoved by this discussion but that was only until they saw the George Washington wig. 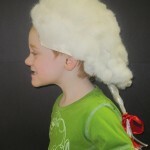 The students each took a turn trying on the fluffy white Colonial style wig and posing for their own profile portrait. While some students were having their photos snapped, others were busy painting the backside of a paper plate gray and sprinkling it with some silver glitter. 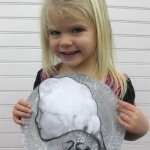 With a little help from the teachers, their photos were then applied to the gray plate to create a larger than life quarter! The faces on these quarters were definitely more exciting than good old George! They made for a great Letter Q Week bulletin board too! On Thursday afternoon, the students drew another face to review their Spanish vocabulary words. This time, the students decided to name it after a Spanish-speaking girl and the obvious choice was Dora. Due to the snow day from last week, the Letter P week Pajama Day and Pizza Party Lunch was postponed to this Friday! The students were more than happy to put letter Q to the side for a little while to party in their pajamas! The students created their own version of the new bulletin board. Using crayons to decorate their quarters and paintbrushes to spread the glue, the students stuck their quarters “in” their piggy banks. 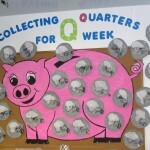 Here is what the Quarter collections looked like. Well, that is all for Letter Q week. It sure went by quickly! As always, thanks for reading and we’ll see you next week!